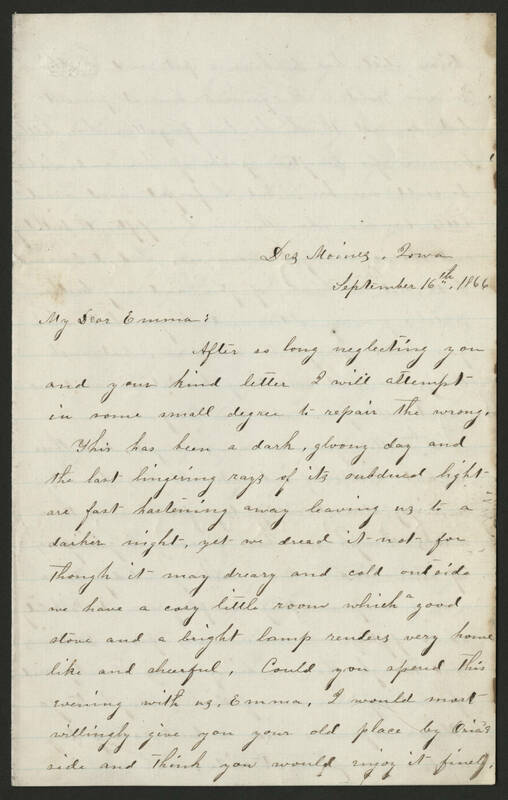 Des Moines, Iowa September 16th, 1866 My Dear Emma, After so long neglecting you and your kind letter I will attempt in some small degree to repair the wrong. This has been a dark, gloomy day and the last lingering rays of its subdued light are fast hastening away leaving us to a darker night, yet we dread it not for though it may dreary and cold outside we have a cozy little room which a good stove and a bright lamp renders very home like and cheerful. Could you spend this evening with us, Emma, I would most willingly give you your old place by Oria's side and think you would enjoy it fine.